Service delivery protests are making the headlines once again. This time in Ermelo in Mpumalanga. The residents of Slovo Park, in Soweto, Gauteng, know all about service delivery protests. Their protests happened in 2009. They were a violent punctuation mark in a rambling and unfruitful dialogue with the city authorities. In a moment of profound symbolism during those brutal days in 2009, the residents stripped the zinc sheeting off the community hall that the council had built about three years earlier, in order to use as shields to protect themselves from the rubber bullets that the police were firing at them. Shortly after these service protests, the leadership of Slovo Park made contact with the Informal Settlement Network (ISN) and began to revise their strategy. Three years of waiting, talking, negotiating, fighting, had produced nothing: no toilets, no running water, no electricity. It was time to take action. The engagement with the ISN had alerted the leadership to the benefits of organising people to deliver these services themselves and then to engage the government around its failure to meet its constitutional obligations and the councillor around his failure to fulfil his election promises. First the leaders compiled a skills audit in the community and in the process identified all the people who had knowledge and experience in plumbing and drainage. In a general meeting the leadership then encouraged the community to organize themselves into street clusters, and prepare to work with the committee to find their own solutions. It was agreed that the community as a whole would work together to install a main pipeline from existing water standpipes to every street in the settlement. Individual families would then be able to make household connections to the main line. The only condition that was prescribed was that there had to be a stopper between the mainline and the individual pipe. The leaders also encouraged people to use the volunteer plumbers to avoid leakages. There were various ways in which the different streets organized themselves. For example in Mapara Street, it was agreed that residents from each site would contribute an amount of R100 for the main pipeline. Once the pipe was installed each household saved an amount of R350 for the household pipes and fittings. As soon as the household produced the money they were able to connect to the mainline. In other streets they had different strategies. Some families bought their own pipes and fittings, laid the pipes and then asked the plumbers to connect to the mainline. The average amount that people spent to have a water connection on site was a mere R450 – including contributions towards a main line. The Slovo Park leadership encouraged the plumbers not to charge for their services due to the fact that it was a community initiative. However residents generally gave between R20 to R50 as a thank-you to the plumber. There are 1152 sites in Slovo Park. 1050 now have water connections. Two weeks after the community had completed most of the installation, City officials from Urban Management arrived on site. In a sorry demonstration of the woeful relationship between city officials and the citizens they are meant to serve, two women who were carrying pipes got such a shock that they dropped their load and ran away. They were convinced they were going to get into trouble for having installed the water connections without formal approval. But the officials had come for another reason entirely. They had come to check on a rumour that the people of Slovo Park were building their own community hall. As a result of their encounter with the frightened women they asked the leadership about the standpipes. The leaders showed them around the settlement. The officials were amazed at what they saw. Given the new emphasis in Government on in-situ upgrading they responded positively to this community initiative and agreed to arrange to get the pressure from the mains adjusted. Then they proceeded to see the community hall – the self built replacement for the one the State had provided, and the community had torn down to protect themselves from the State’s rubber bullets. Through a connection made between Informal Settlement Network President, Patrick Magebhula, and the University of Pretoria, six architecture students had been working with the community for several weeks on the design and upgrading of the community hall. Initially the idea was for the students to assist with the blocking-out of Slovo Park. However Slovo Park had been laid out into plots and roads in the early nineties – by the residents themselves. So instead the students met with community members and ISN leaders and agreed to help them analyse the data they had collected by means of a community driven household survey. As a result a decision was taken to rebuild the community hall, with the students providing technical support. The students came with no resources other than their enthusiasm, their training and an eight-week time frame. This really helped to make things happen. The community shared their ideas about the design of the hall. It had lost all its cladding, the slab had crumbled and the area in front of the hall was being used as a dumping ground. The architects took note of the community’s ideas and went to the drawing board. They came back a few days later to show the community their drawings and their models. The community suggested numerous changes, which the students then incorporated. This process took two weeks. In the meantime the leadership began to recruit people to work on the project. They revisited their skills audit. 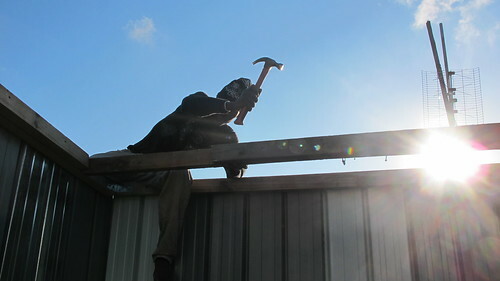 Bricklayers, tilers, plumbers and welders were asked to come on board to help upgrade the hall. Community members without skills were also encouraged to volunteer. Community leaders also started collecting contributions of R5 per household to go towards food for the volunteer workers. Construction started in October 2010 and the upgrade was completed on the 19th of November. The upgrade included completion of the hall; use of old dilapidated post boxes as serving containers and benches; paving of the entire area in front of the hall; the planting of 20 trees and the installation of four taps to water the trees with grey water. A community member was appointed as the project manager. His job was to co-ordinate everyone on site – including the students who became part of the labour force for the full six weeks. The energy and camaraderie on site was palpable. But it was by no means all plain sailing. It was a struggle to secure materials. But eventually material came from various sources. Through the efforts of the students, private companies supplied the paving. The students also managed to get trucks with ready-mix to dump left over concrete on site and then they got tiles donated. As the momentum for donations grew the community got involved as well. One resident managed to get ten massive gum-poles donated by his employer. Another resident organized leftover tar from Road Works. Yet another resident used the steel rims of two car wheels for drains. Some residents loaned their generators and others offered the use of their bakkies and cars. All the artisans brought their tools on site – spades, paint brushes, picks, saws, welding equipment, tiling equipment … Finally the community organized the cladding for the walls of the hall by going to the nearby river to cut tbamboo. On Saturday the 20th November the hall was officially opened. Two officials, one from Johannesburg Municipality and the other from Ekhuruleni attended the function as well as senior lecturers from the Department of Architecture at the University of Pretoria. The students mentioned that they would like to continue working with the Slovo Park community. However the distance between Pretoria and Slovo Park is too far for them to maintain long term relationships, It was suggested that a link should be established between Pretoria University and Wits and that ultimately Wits Architecture Department should be brought on board. The Pretoria University has since asked whether they could assist the Informal Settlement Network in Tshwane. And what about the City and the community? If the upgrading process is to go to scale, if other services and amenities are to be provided and if Slovo Park is to be replicated throughout Johannesburg then this partnership has to become central. It takes a lot more work and more courage to design for change than it does to fight for it.